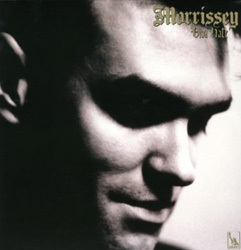 This remastered and redesigned edition of Morrissey's debut solo album differs from the original release by the omission of album track "Ordinary Boys", the addition of demo "Treat Me Like A Human Being" and by the fact that "Late Night, Maudlin Street" has had its intro and outro amputated, making the song shorter by almost a minute. Remastering by John Davis under the supervision of Stephen Street. The cd edition includes a written introduction from Chrissie Hynde. 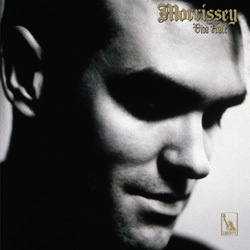 The front of this new edition still features the same Anton Corbijn photo as the original edition but the font and layout of the text was changed. 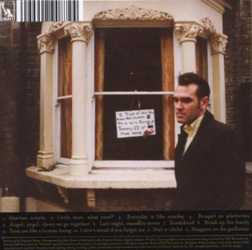 The back artwork was completely redone, now featuring a shot of Morrissey by Jake Walters (view left). 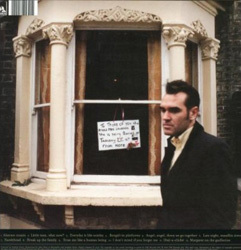 The LP is gatefold and features a photo of Morrissey by Kevin Cummins (image needed). "BLOOD BATHS I HAVE KNOWN" / "S####################BA"
UK or Europe: This release was promoted with the help of a promo cd-r [EMI/Liberty CDSMLPDJ 70], but it is not clear which market was being targeted (UK and/or Europe). The disc has a white surface with minimal black text (album identification at the top, an EMI logo and "Promo Copy") and features the full content. It comes inside a clear plastic sleeve, paired with an insert showing the album artwork on the front, but just the image, no text. Its reverse is black with white track listing, Liberty logo and a block of credits at the bottom. The insert sometimes has a Kevin McCabe plugger sticker on its front, and has been seen with a one-page A4 press release announcing the initially planned release date of 26th March 2012. Note: the promo cd-r showing the stock album artwork on the front of the insert as well as album identification, a Liberty logo and some copyright at the bottom of the disc, is a fake.